Could mean a lot of things, but I was thinking of refugees in flight. Widows#5 Performance/Installation was one of my best media pieces of the series. 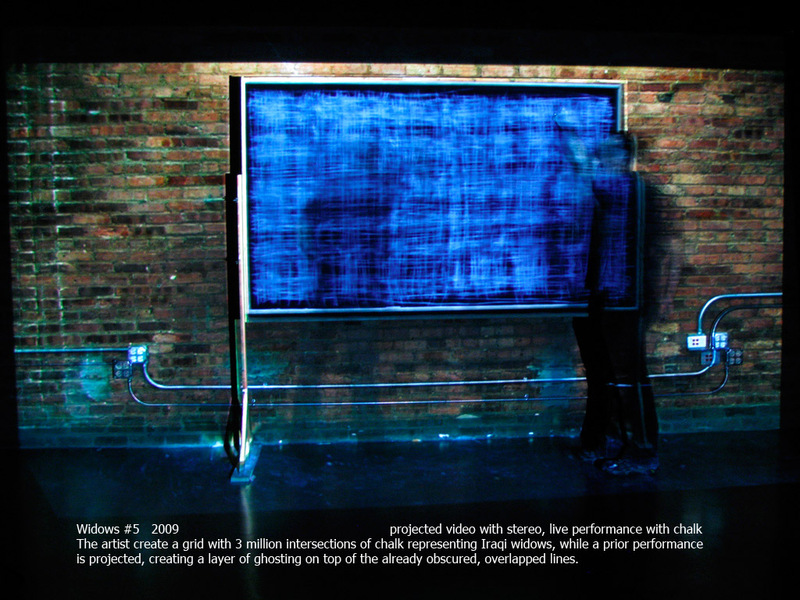 Projection of up to five videos of me completing an earlier performance was layered on top of a live performance of Widowsweave on a chalkboard that I built on which 3 million intersections of line are drawn. As an extension of my War Cabinet and Widowsweave projects, 3 Million Meters is an endurance based, goal oriented challenge to run 3 Million Meters in one year, beginning on May 1st, 2013– the 10th anniversary of the famous “Mission Accomplished” speech. By December 31st I have passed 2 million meters with four months to go. I have also begun a campaign to enlist others to join in a community of endurance-based activists, raising money for Women for Women International. Artistactivist Fundraiser will be held on April 3rd at Work Studio which has generously donated their space for the event. Kevin Valentine created this video for not-for-profit World Bicycle Relief For their December Annual appeal in conjunction with Creative Director Matt Pierce and Sound Artist Ramah Jihan. The video was produced entirely in After Effects – The Audio was sampled entirely from manipulation of a WBR bicycle. 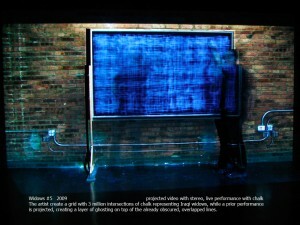 The Weisman Award Show, including three panels from Widoweave exhibit is up through mid-October.